Navel piercings continue to hold their own in the realm of body piercing. They were all the rage back in the early 2000s and a variety of new styles have continued to make them a common choice for people of all ages. With a huge range of piercing jewelry available, this is one of the easiest ways to personalize your look! What is a Navel Piercing? A navel piercing is any piercing that is placed around your belly button. The most common type of navel piercing is on the upper edge of your belly button so that the jewelry hangs down into the navel opening. However, some people choose to have navel piercings placed across the belly button or at the bottom edge of the navel opening. We say that any piercing can take six months to a year to fully heal. We give a wide range estimate because every person heals so differently. Due to the nature of this piercing, it often takes longer to heal than other types of body piercings. During this time you should not change your jewelry. You should also be sure not to use heavy jewelry that pulls down into the healing piercing wound and cause problems. The less you mess with it, the faster it will heal. With social media making a buzz about just about everything we do, body piercings are no exception. 2017 has already given birth to a number of trends relating to navel piercings specifically. First, people are getting more creative with their navel piercings by adding a second piece of jewelry to the mix, “anchoring” the barbell at the bottom with an extra stud. This gives the illusion that the piercing goes all the way through the belly button although it is actually in pieces. 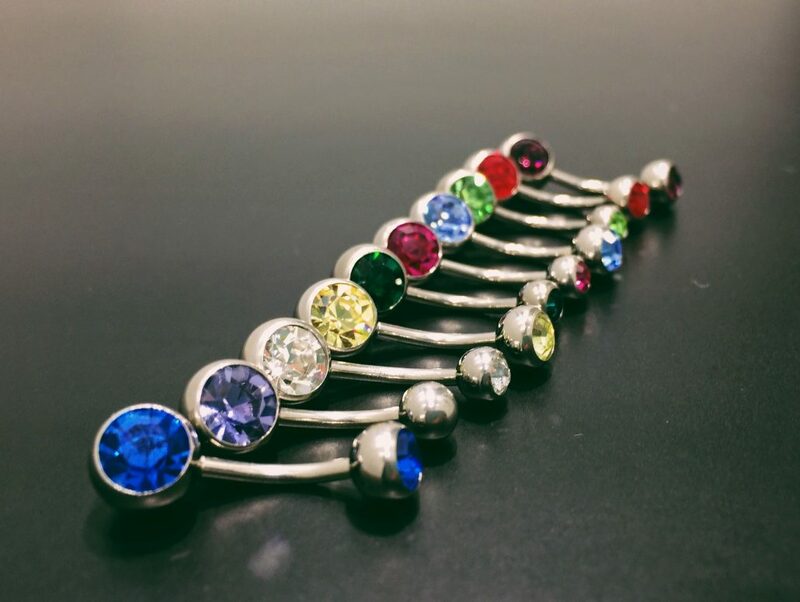 People have found joy in layering their jewelry by getting multiple navel piercings all around the perimeter of the belly button and using straight barbells as well as curved ones to create a crosshatch of studs and bars. To learn more about navel piercings at Almost Famous Body Piercing, contact us today with your questions, or stop by and get pierced!